By focusing light down to the size of an atom, scientists at the University of California, Irvine have produced the first images of a molecule’s normal modes of vibration – the internal motions that drive the chemistry of all things, including the function of living cells. Prodding the molecule with the light confined on the silver atom, the team delved into the quantum regime among the twittering atoms of the molecule, becoming the first to record vibrational spectra and observe how charges and currents that hold atoms together in bonds are governed by the molecular vibrations. To achieve atomic resolution, CaSTL researchers set up their experiment in an extremely high-vacuum and low-temperature (6 kelvins) environment to eliminate all external motions and positioned their single-atom probe near the targeted molecule, within a distance less than the size of an atom. Glass lenses wouldn’t work in this type of microscopy, in which features are resolved on a scale that’s a thousand times smaller than the wavelength of light. In their experiment, the team poked and prodded the cobalt-based molecule with a silver atom being zapped with laser light, risking agitation of the target. The CaSTL scientists mitigated this possibility by freezing the sample onto a copper substrate. The molecule flattened by binding to the copper, exposing itself to the close approach of the scanning tunneling microscope tip. 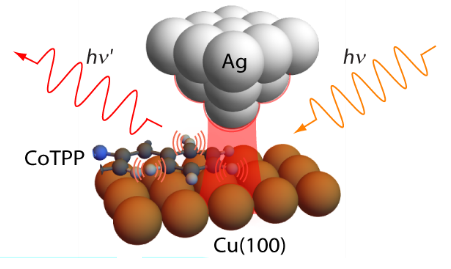 By moving the silver tip up and down in relation to the sample to keep a distance of about 2 ängstroms (1 ängstrom equals one-ten-billionth of a meter), the researchers were able to record differences in frequencies at various positions within the molecule. They maintain that the incredible resolution stems from quantum mechanical tunneling of plasmons (electrons interacting with light), countering the notion that tunneling would decrease the electric field necessary to excite the molecule. Next, CaSTL scientists will further refine their measurements of electrical fields within molecules, work to detect where atoms are missing from molecular structures, and use quantum interference principles to characterize even finer details. Founded in 1965, UCI is the youngest member of the prestigious Association of American Universities. The campus has produced three Nobel laureates and is known for its academic achievement, premier research, innovation and anteater mascot. Led by Chancellor Howard Gillman, UCI has more than 36,000 students and offers 222 degree programs. It’s located in one of the world’s safest and most economically vibrant communities and is Orange County’s second-largest employer, contributing $5B annually to the local economy. For more information, visit www.uci.edu.